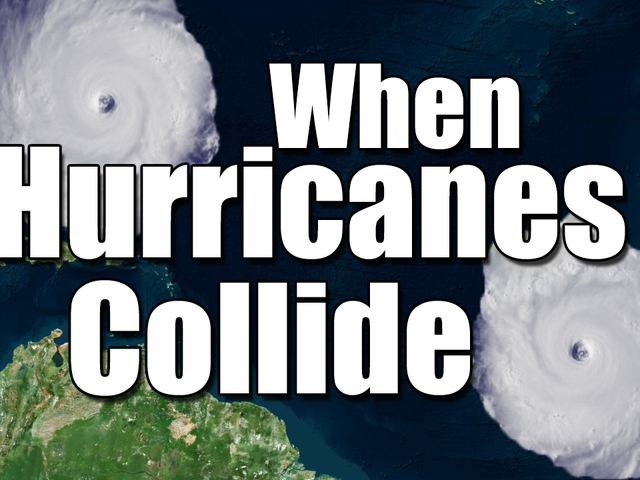 When two hurricanes get close enough, they start to alter each other's courses like two huge weather systems doing a dance. This is called the Fujiwhara Effect — and it could happen this weekend when Hurricane Matthew and Tropical Storm Nicole approach one another. Most of the media coverage was focused on Hurricane Matthew this week, and rightfully so since the deadly storm made its way through Haiti, Cuba, the Bahamas and eventually, Florida. Meanwhile, Nicole quietly formed and spun in the Atlantic, affecting no one. Once Matthew moves up the Georgia and South Carolina coasts, it's going to get pushed into the Atlantic by a large front moving across the country — pushed right into Nicole. Once the two storms are within 870 miles of each other, the centers of these storms will begin to rotate around one another in a counter-clockwise motion. That means Matthew will likely begin rotating to the south while Nicole will rotate toward the north. This interaction is named after Sakuhei Fujiwhara, the meteorologist who first described it in 1921. Two hurricanes or tropical storms don't have the opportunity to interact very often, so it's rare to see this in action. Hurricane Iris and Hurricane Humberto did a similar dance in 1995 before Iris would later go on and absorb a much smaller Tropical Storm Karen. And in 2005, Hurricane Wilma absorbed Tropical Storm Alpha. It appears this event only happens in the Atlantic once every decade or so, and this weekend could be your chance to witness it in action.